HAPPY: A few days after the meeting in Skien, Ann-Karin Martila's backpain disappeared when God "operated" her back in the course of the night. During the meeting in Skien she testified about the healing of her ankles and heels that happened in 2012. Just before Easter earlier this year Ann Karin Martila (72) from Porsgrunn experienced something that would make life very difficult. Martila was going to wipe dust off a shelf and therefore used a stepladder. Suddenly she lost balance and fell to the floor. Great pain surged through her back, and she was lying on the floor for half an hour and could hardly breathe. -I got up, but I figured that it would be fine, and did nothing more at first, she says. But sadly the back did not improve. She had severe pain in her back and felt completely paralysed, because she could hardly walk. Eventually she went to the doctor, who sent her to have radiology performed. The images showed two slipped discs, fractures in two vertebraes, and two vertebraes were uneven. Everyday life for Martila became more and more heavy. She went to the chiropractor and used painkillers. Martila could not move much, because her back was working poorly. -I stayed mostly inside, and I needed to have someone drive me to the store, which is just down the street from where I live. Life was very reduced. One day Martila watched the television program "The Miracle is Yours" where Svein-Magne Pedersen prayed for the sick. She placed her hand on the television set and her back was healed. But sadly after a few days the pain returned. Fortunately she did not need to wait for so long to receive a new prayer. On the weekend of 6.-7. 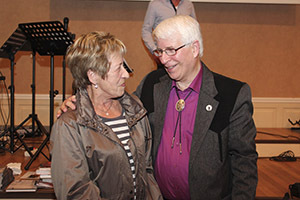 September Faith Life Bible Centre arranged a miracle meeting with Svein-Magne Pedersen in Skien. She showed up there and received prayer again for her back. -When Pedersen prayed I felt something scratching up and down my back, and I was a little bit better. I still felt pain, but a little later in the week something special happened. I awoke in the middle of the night from something happening in my back. It was a little painful, but it was something that was being put into place. I was totally surprised, because the pain disappeared. God had operated my back. It was magnificent! she says pleased. In the aftermath Martila has been fully active and has tested her back in the time that followed. Martila is so grateful for what has happened. When she later had an appointment with the chiropractor, he thought it was amazing how quickly her back had recovered. -I have gone hiking and running up and down the stairs at home. I have got my life back. It is amazing, she says happily. Martila can also testify of Jesus healing her before through Pedersen's prayer. It happened in Porsgrunn Baptist church in March of 2012. -When I was 28 years old, I was in an accident. I had to sit in a wheelchair and train up my legs again. The accident led to regular shooting pains and arm and leg pain. My ankles and heels were also in pain. During the meeting the pain disappeared. -Thank God for all that has happened! said a happy Ann Karin Martila.